Featuring an elegant brass finish on quality stainless steel, these individually sold stanchions featuring an easy two-part assembly are just the item for your crowd management needs. Measuring 24 inches in height and 14 inches in diameter, the stanchion features a retractable belt that extends up to 11 feet, making for a financially and spatially economical option. The belt comes in colors black, red and blue, along with an included four-way adapter top to create the line configuration you require. As your established enterprise grows in scope and scale, it is but inevitable that a proportionate increase be witnessed in customer influx at your enterprise’s physical operating area. In order to accommodate your growing number of visitors and keep the experience of their engagement with your concern as smooth and hassle free as ever, the use of crowd management tools such as stanchions is highly recommended. The Luxury Brass Mini Stanchions with Retractable Belt, with their minimalistic non-intrusive design and solid construction favoring special economy, are the platonic ideal for what stanchions should be. 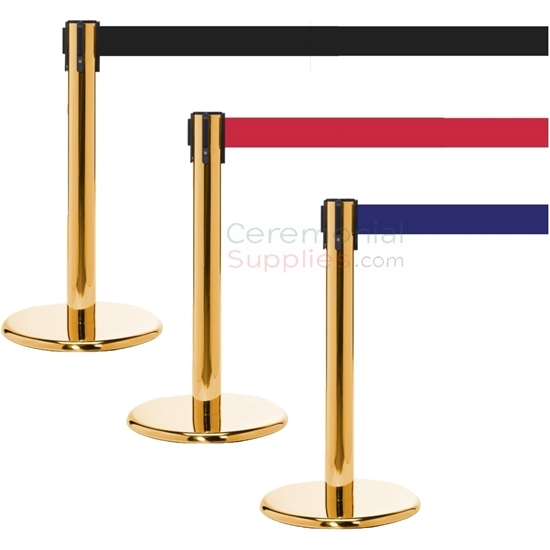 To peruse through many such equally capable stanchions and crowd management offerings that might fit your concern’s needs, feel free to go over CeremonialSupplies.com’s other offerings.